Right now, most of you are sleeping. The rest of you crazy people are standing in line somewhere in the freezing darkness of way-too-early morning with mental maps of your Black Friday bargain routes. Here is an idea that leaves you feeling warm inside and out. Giving and receiving things is fun, but sometimes, I find what I really want is more experiences with the people I love. For a frugal and meaningful gift alternative, give you for Christmas. Not only is it light on the wallet and heavy on the sentiment, but it is symbolic of Christ's gift-giving. How is it that the most loved person in the history of the earth gained a following without giving out a single free Wii? He simply gave of himself. Some of my very most favorite gifts have been acts of service or tokens of love from my husband. On our first Christmas Eve, he forbade me from going into the laundry room of our tiny apartment. He disappeared into the windowless room, and all I heard for nearly an hour was the sound of a drill. The next morning, I unwrapped a little wooden stool he put together from a kit bought at the local thrift store. He explained it was a kissing stool to help make up the difference in our heights. I was so touched by the thought he put into this simple gift (and, of course, by the promise of many sweet kisses)! 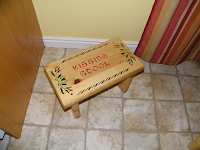 I was in such a good mood the following day as I painted the words "KISSING STOOL" on that stool. Another gift my husband gave me that Christmas (and a few times since on different holidays) was a short note expressing his love for me and excitement starting out our journey together. I learned that first Christmas as husband and wife that I really love these types of gifts more than I enjoy stuff. Below are some ways you can give of yourself. Frozen meals - from a working woman to a stay-at-home mom, who doesn't appreciate not having to cook every so often? Cookies accompanied with recipe - YUM! 'Nuff said. A jogging partner - The frequency is up to you! Facial - My husband actually enjoys when I take care of him and apply treatments to his face. An hour of housekeeping - Isn't it nice to get a helping hand? Free babysitting - Need I say more? Schedule of Girls' Nights Out - Sometimes, all you need to get through the month is looking forward to a fun night with friends! Computer tech help - If you're the guy or gal with the skills, there are lots of people who would enthusiastically receive your gifts and talents. Song or poem - If you can write these, create a short one for someone on your list. Stuff is fun, and I really appreciate some of the great stuff I have received over the years, but I find it easier to remember the tokens and service I have received because of the emotions they triggered for me. I feel really special when I know someone has been thinking of me beyond scratching my name off a list. The Kissing Stool is still being used in our kitchen today, 10 years later.